I walked this, the 13th stage of the Capital Ring on the 27th December 2006. The stage starts in Stoke Newington before heading down to the River Lea besides Walthamstow Marshes. The River Lea Navigation is then followed all the way to the end of the stage by Hackney Wick. From Abney Park Cemetery the path crosses Stoke Newington High Street and heads down Cazenove Road, photo 1, at the start of stage 13 of the Capital Ring. The route then takes the second left, Kyverdale Road, then the first right, Filey Avenue which is followed to Clapton Common. While this section of the route in generally very well signposted I did not spot a waymarker on the junction of Cazenove Road and Kyverdale Road which meant that initially I missed the turning and had to backtrack slightly once I realised my mistake which fortunately was not much further down Cazenove Road. Crossing Clapton Common the route of the Capital Ring heads down Springfield and bears left into Springfield Park. From Springfield Park there very extensive views across the Lea Valley towards Walthamstow and beyond, photo 2, although these were somewhat obscured by the rather grey and damp weather. The route now heads downhill through Springfield Park to join the River Lea close to Springfield Marina, photo 3. I had previously walked the rest of this stage of the Capital Ring when I was walking the Lea Valley Walk. 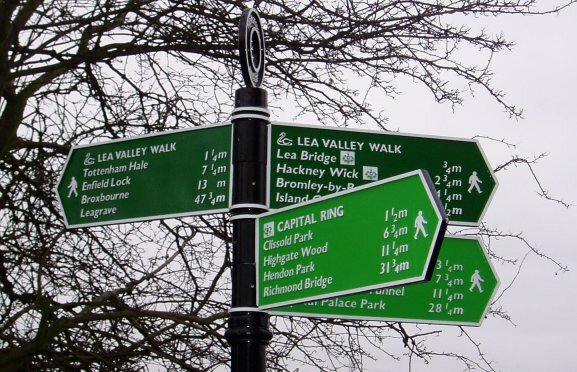 Since that time a new fingerpost, photo 3, has appeared giving mileages for both the Capital Ring and Lea Valley Walk. The Capital Ring crosses over the River Lea, photo 4, and then heads South towards the Lea Bridge Road running alongside the Walthamstow Marshes, photo 5. Just before the Lea Bridge Road is reached crosses back over to the other bank of the River Lea. The route continues to heed South alongside the River Lea Navigation, past the Princess of Wales pub, to cross the canal once again besides the Middlesex Filter beds, photo 6. From there it is straight down alongside the canal. The route runs for some distance alongside the playing fields of Hackney Marshes and just before crossing under the B112 Homerton Road passes the old Lesney Factory, photo 7, who were the makers of Matchbox Toys - which will mean something to people of a certain generation. A little further on the route passes under the A12 East Cross Route and continues down through a more industrial landscape. On the way I passed a small flock of Greylag geese besides the canal, photo 8. This stage ends at Hackney Wick where Hackney Wick train station can be accessed by taking the bridge that carries White Post Lane over the canal, photo 9. Stage 14 continues along down the canal. The GPS made the distance between Stoke Newington and Hackney Wick 3.39 miles.